I read a little book a while ago, so long ago that I don’t remember anything about it except one analogy. 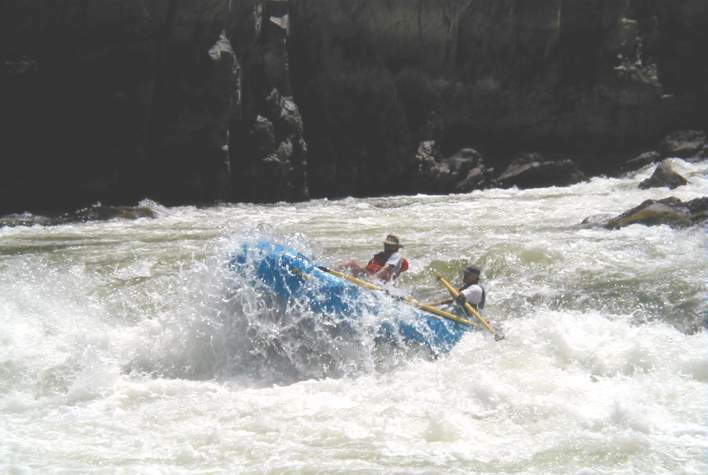 The author compared raising children through adolescence to putting them into a river right at the start of some rapids (in a canoe or some other small personal watercraft—I told you I don’t remember much about it), and waiting for them to come through those rapids into the calmer waters downstream. The author said that you did your best to prepare them for the rapids (which represent the adolescent years), and that life during those years would be tumultuous, but the kids would come out safe at the other end. I’ve seen this happen. I’ve been there during the years of preparation, the years of tumult, and a few years, so far, of wonderful adulthood. In an earlier article I wrote about building character in your kids. This time I’m going to add to and extend the idea a bit. The question I want to answer is, How can I prepare them for the rapids of adolescence? 2. Take Anger Out of the Equation. A parent who has figured out his or her fundamental principles will have within them a degree of self-assurance that brings calm assertiveness. (Many of you will be reminded of Cesar Milan’s useful mantra concerning being the pack leader.) Someone who possesses this undergirding of principled thinking, while being open-minded and always ready to learn, will be less prone to anger and frustration, two emotions that are counter-productive in raising children. Remember this: The time for instilling principles is not ideally in moments of crisis and argument. It is always most effective to teach in an atmosphere of receptiveness and calm. Find times to talk, before the crisis erupts. They are usually smarter than you give them credit for, so take the time to explain things. When you treat them, not as equals, but as smart, reasonable human beings, they tend to appreciate it. 3. Help them Find their Gifts. Some parents have decided what their child’s gifts will be before they are born. Unless you are a geneticist from the future, you can’t possibly know, and attempting to force preconceived gifts upon a child can be a cruelty. Rather than force it, try to find it. And until you and your child find it, enjoy the search. And when you find it, enjoy it with them. Just about every parent has heard their child yell out, “Look at me, Mom!” Our children desperately need our admiration. They need us to delight in them and the things that are special about them. A child who has these gifts that only a parent can give them will have the strength to stay upright and afloat through the rapids. Do you ever watch them when they’re not aware that you’re around? Or when they’re interacting with others? Does your heart swell when you see them forming into precious human beings, unlike all others? They can feel that joy coming from you, and it means the world to them, whether they’ll own up to it or not. These are just some of the ways we can prepare our children for the rapids of adolescence. I hope that these few words will be helpful and will stir up within you additional thoughts and ideas. Please share them by commenting on this article.